I'm pretty sure there's a species of bug hanging out in my basement yet to be discovered by entomologists. It is impervious to Febreeze, Clorox bleach and Downy wrinkle release. I swear it's the size of a large toddler. Every time I go to throw a bath towel over it, it quickly jumps away. Quite quick on it's legs, all eight of them. And let me tell you, this thing can get some serious air! Please take note, I've taken to naming it Horace. And I would like for it to vacate the premises immediately. Unless that is, I can teach it to do my laundry. I completely agree with Nicole - that picture made me cringe and my skin crawl! I am a real baby around any creepy crawly so anything like and that and I would be going crazy! Oh and I would move out first I think! Gross, but that's what I was thinking about! That picture is terrifying. Seriously - yikes. Wow! That thing is crazy!! 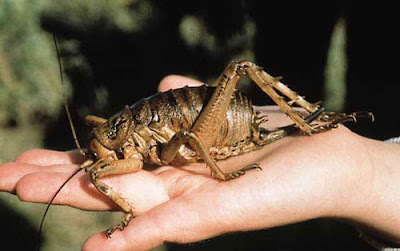 It looks like a mutant grasshopper, lol. Have you tried to look it up on the net? Weird!!! holy smokes! You are so brave to deal with a large bug. I would probably move out rather than facing another incident with horace. lol. good luck. Try those bug traps that are all sticky so then it will jump on it. Ugh my skin is crawling just reading this!! Ha ha ha... I love that you named it Horace! Gross!! I have a major phobia of jumping bugs :p I hope it vacates your home ASAP! if you figure out how to teach bugs to do laundry let me know - i have some palmetto bugs aka giant roaches lurking in dark corners of my house. if they aren't going to vacate the premises then i'd like them to start pulling there weight around here and by doing some chores! ewwwww!! bugs are sooooo gross!! PS: I have a giveaway going... come on over and enter! Ewwww, that picture creeped me out and umm yeah, my husband would hear my piercing screams and then he'd be taking over the laundry until that thing was dead! ewwwww! if that thing got near my laundry, I'd have to buy new clothes! hahahaha! I wish you luck! What the heck is that?!! The desert has scorpions and snakes, but that thing scares the bejeezus out of me!